Featuring an elegant leather teardrop with a fully customizable metal tag this keychain offers the best features from both our metal and our leather keychain offerings. The fully customizable center offers an epoxy domed logo on the front that will show off your company logo in vivid color. The back is available for engraving your dealerships pertinent contact information. The soft smooth edges of this leather key tag do not poke and snag the linings of your customers pockets or purses. The heavy duty split ring attaches securely to both keys and car fobs ensuring everything stays safely in hand. 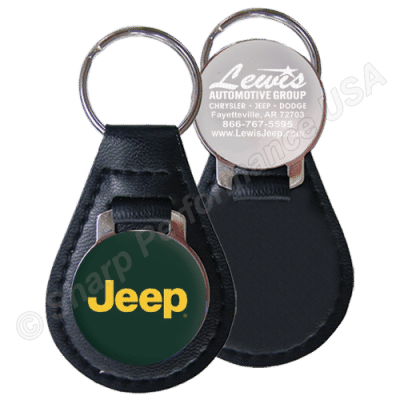 Promotional car dealer keychain shown as example. Let us create a custom keychain with your organization’s logo. Wholesale bulk only. Not for retail. Front Side: Full color domed logo on front.